National Donut Day was last Friday. We saw you eat that toasted coconut thanks to your Instagram. And with National Rosé Day being Saturday, we know your Domaines Ott is chilled. But today is World Environment Day, easily more noteworthy than donuts and rosé, so we hope you'll craft a post equally as time consuming as that glass of rosé aligned perfectly with the sunset. Bring awareness to something more important than Rosé All Day. In honor of Wold Environment Day, we've compiled a list of 9 super simple changes you can make in your daily routine that will actually save the planet, which we believe is worthy of a reward donut. The call to action this year is "Beat Plastic Pollution" which is one of the greatest environmental challenges of our time. First, look around you and count everything made of plastic that's within arms reach - and don't forget to include the pieces of your outfit made of polyester. Now let's consider why we use so much plastic if it's so harmful. Why not just stop making things out of it, right? Two words - cheap and easy. Plastic is a cheap, lightweight material to buy and it's easy to make. What most people don't know is that plastic is actually a valuable resource, but only when it's reused and recycled. Rather, with our growing on-demand culture, we have become reliant on plastics as disposable material. When plastics aren't re-used or recycled it sees two fates; it is either burned in a landfill or is floating in our oceans. In fact, about 13 million tons of plastic end up in our oceans every year. How does this effect you? When plastic ends up in a landfill, it's incinerated and all those toxins are released into the air for us to breathe. Styrofoam being one of the worst plastics because of its genetic make up of nasty, carcinogenic toxins. Ugh! When plastics make it to the ocean, lots of sh*t goes down. The material is often ingested by marine life, which is how those gross toxic chemicals enter our own food chain. I don't think this is what Elton John meant when he wrote the "Circle of Life" but I've been wrong before. Then there are plastic bags which often block waterways, exacerbating natural disasters and clogging sewers, creating breeding grounds for mosquitos and pests, increasing the transmission of vector-borne illnesses. Hello Zika. Bet you never thought your beach travel plans could be ruined over your Starbucks straw. Now consider the economic impact from cleaning to keep these problems at bay (pun intended). Studies suggest that the total economic damage to the world's marine ecosystem caused by plastic amounts to at least $13 billion every year. One of the biggest contributors of plastic waste is single-use items, meaning it is designed to be thrown away after being used only once (like that sushi you had delivered to your apartment last night). 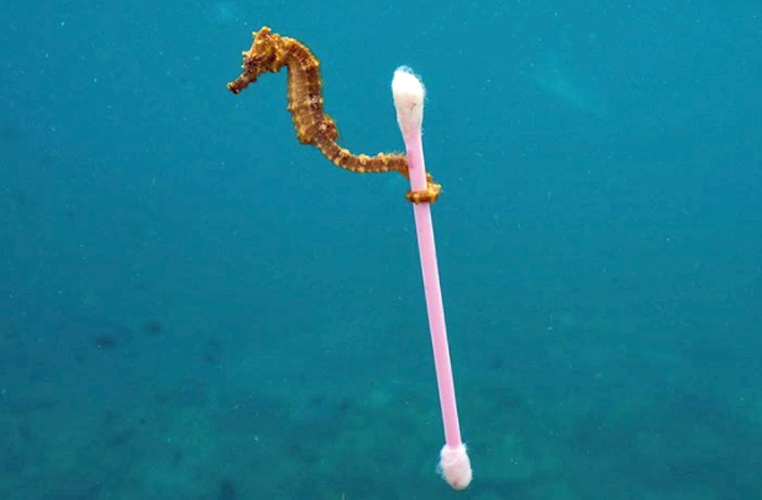 The most prolific single-use plastics found in the environment are, in order of magnitude, cigarette butts, plastic drinking bottles and caps, food wrappers, plastic grocery bags, plastic lids, straws and stirrers, other types of plastic bags and foam take-away containers. This is where you should focus on reducing your footprint. The good news here is that single-use plastics is an area where individuals can effect real change by conducting simple daily habits. 1. Carry a reusable water bottle. We are obsessed with these. 2. Take a reusable bag to the grocery store. This makes us feel less guilty about that last Lululemon purchase. Those bags can hold several pounds of produce! 3. Speaking of produce - when grocery shopping why put your avocados or kale in a produce bag, just to put them in another bag? You're going to wash the leaves when you get home anyhow. 4. Avoid plastic straws, opt for glass or paper instead. Better yet, skip the straw and save yourself the wrinkles. 5. On the last step of your Seamless or GrubHub order, remember to check the box indicating you don't need plastic utensils. You're at home. You have forks. 6. An easy one, dispose of plastics in the proper recycling containers. Almost every fast casual restaurant is set-up for recycling, so do your part by separating the materials and putting them in the correct recycling bins. 7. Use these glass or steel food storage containers over zip lock bags. Your taste buds will thank you for the freshness. 8. When traveling, TSA wants you to put all your cosmetics in a plastic bag. We suggest Glossier's reusable bag. 9. Lease up? Pack up your apartment into these heavy-duty, reusable stacking containers. They will drop them off when you need them and pick them up when you're done. A dual approach to recycling by eliminating single-use cardboard waste and reusing valuable plastic.